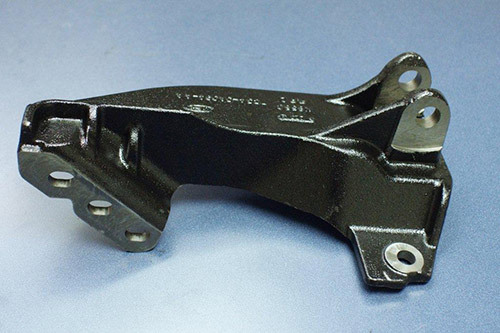 This large ductile iron bracket was designed for use as a steering stabilizer in an automotive application. Known as a track rod bracket, it's composed of D65-45-12 Ductile Iron, and we manufacture 220,000 of these components per year for our customer in Michigan. Manufacturing requires the use of our state of the art precision CNC 7 axis flex machine cells which include an incoming conveyor, and robot load/unload features. This allows for the high volume and precision for the straddle milling, drilling, and slotting processes required for the fabricating these parts. 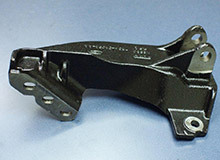 The customer supplied drawings called out dimensions of 14.5" in length, 8.5" in width, 6" in height, and tolerances of ±0.005", with machined and E-coat finish. Quality throughout the production run is maintained through functional gauge checks. For more information, see the table below or contact us directly. Overall Part Dimensions Length: 14.5"